Billions of people around the world rely on rice as a mainstay of their diet. The grain provides about 20 percent of the calories consumed by humans worldwide. Rice production is critical for global food security, and demand will only grow as the world's population expands by an estimated 2-3 billion by 2050. To keep up, farmers will need new strains of rice that can be grown both efficiently and sustainably, in new environments and in a changing climate. A vast new genetic resource created by a team led by Doreen Ware, Ph.D., of Cold Spring Harbor Laboratory (CSHL) and the U.S. Department of Agriculture, will accelerate efforts to develop new rice varieties, guiding breeders to the genes plants use to resist pests, thrive in inhospitable environments, and produce abundant amounts of grain. In research led by Dr. Rod Wing, a plant scientist at the University of Arizona, and Dr. Joshua Stein, manager of scientific informatics at CSHL, an international consortium of scientists sequenced the genomes of seven wild species of rice and two domesticated cultivars: a drought-tolerant variety called Nagina 22, and IR8, so-called "miracle rice," a high-yield variety developed in 1967 and pivotal in the Green Revolution that helped relieve famine in Asia. Comparing these nine new rice genome sequences to four previously available wild rice genomes, the team has generated a telling new view into the plant's 15-million-year evolutionary history. 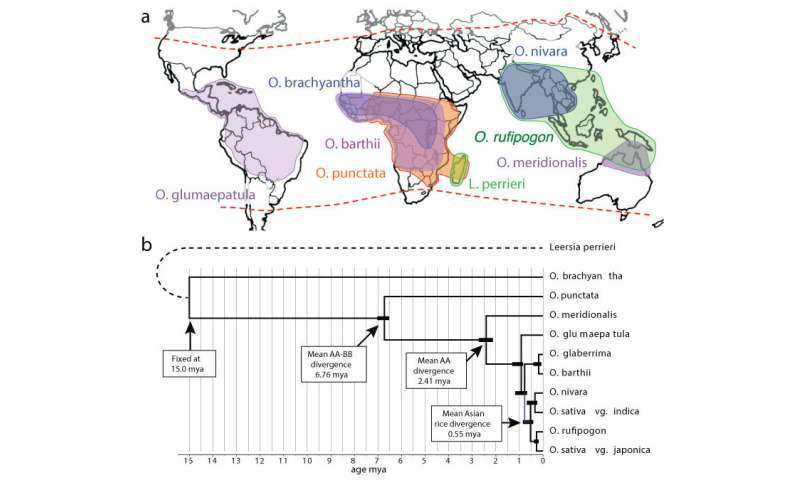 Because the newly created genetic resource is so broad, representing distantly related rice species that have evolved in habitats throughout Asia, Africa, South America, and Australia, it enables researchers to zero-in on valuable sequences that have been preserved as the plants adapted to different growing conditions. "We're able to look at these wild species, which have been exposed to different diseases or other challenges. In some cases, these plants have been able to adapt to those challenges and we can see footprints of that in the genome," explains Ware, a CSHL Adjunct Associate Professor. In a report published January 22, 2018 as part of a cover story in Nature Genetics, the team highlights one set of valuable tools uncovered in their analysis: thousands of genes that appear to encode disease resistance. Harnessing these genes to develop crops that are better equipped to resist infection by fungi, bacteria, and other pathogens could reduce the need for pesticides and help ensure more reliable rice harvests around the world. Stein says the information embedded in the newly available genomes will accelerate the development of improved rice strains through traditional breeding practices as well as with the aid of new genetic technologies. The team's comparative analysis also offers scientists new clues into the molecular mechanisms that drive the evolution of new traits, of potential value to breeders.